By 1943, Berlin is essentially devoid of men. Those who are left are mostly far too old or far too young to go to war, or they’ve been left behind for some other reason. Sigrid Schroder is just one of the many women left in Berlin, living with her bitter old mother-in-law while her husband is at the front. Although she may seem like a good German wife, Sigrid is not satisfied with her life as it is, first beginning an affair with a Jewish and then befriending a somewhat odd young girl nannying for a family in her building. Before long, Sigrid’s world view – particularly her understanding of her country and the war in which it is engaged – has been turned on its head, making her do things she would have never previously considered. You may be “ho-hum”ing about yet another World War II novel, but Gillham does come at the subject with a fresh set of eyes by concentrating on the German home front. 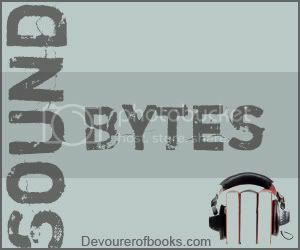 There is a quiet, slow build to City of Women that can make the early pages somewhat of a slow start, which may cause some readers to have difficulty getting into the story, I certainly did. It took me twice as long to listen to the first half of this as the second half, because I just didn’t find myself making time for it. As Gillham’s story unravels, though, I became increasingly invested in Sigrid’s life, and curious to see how her character would continue to develop. There is a pretty major character arc throughout the book, but it is all set up very well and is quite believable. 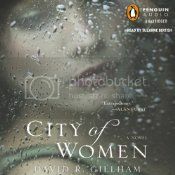 Suzanne Bertish is, I believe, a new-to-me narrator, but she does a wonderful job narrating City of Women. Part of the believability of Sigrid’s character arc is attributable to Bertish’s excellent vocal characterization. Bertish also does a great job of making clear which pieces of text are dialog, so that it is easy to follow what is happening at any given time. Quite enjoyable after the slow beginning. I do think I might have connected earlier in print, but I suppose that isn’t something I can really know. By the way! If you’re now thinking you want to read this book, but not listen, the ebook will be $2.99 on all ebook platforms on Sunday, October 21 (or so I’m told). After our conversation on Twitter yesterday, I think I’ll try this in print. I think that would be better for me since it starts slow. This book was given a nice review on Book Riot and I’ve been meaning to read it. The insider information about it being 2.99 as an e-book on Sunday is much appreciated! I’ve been steadily getting back into World War II-related fiction lately, and I’m currently listening to The Long Walk on audio — so I have a feeling I’d like this one! This book does sound like a good story, and worthwhile even though it’s a slow starter. I can’t decide whether to read it or listen to it, but the $2.99 price point is tempting. The premise of this story is what caught my interest. I was looking forward to listening to it but maybe I will read it in print.